The local news over the last week has been the storm in Wellington. It was the biggest in a while, by some measures bigger than the infamous 1968 storm. It took out the rail link between the central city and the Hutt Valley, leading to long waiting times and difficult commutes. That has now been fixed and the trains are running this morning. That water right there? Only going to get higher. Sea level rise is projected to raise the water level over the next 100 years and beyond. This Niwa report (pdf) provides a lot of detail, but the basic idea is that we’re looking at 1.5m to 2.0m rise in the average sea level over the next century. Of course, that’s the average. Storm surges will push the water higher at random intervals. This is an interesting map, from the 2011 regional transport plan (pdf) (Figure 8, cropped). It is essentially a ‘heat map’ of access to public transportation, red being the best access, then orange, yellow and blue. You can see the narrow rail corridor linking the central city with Lower Hutt, the black line on the northwest edge of the harbour. That’s what washed out. The uplift created a new fringe of beach and rock platforms along the Wellington coast…. 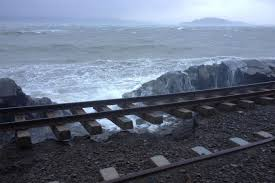 The newly exposed strip of shoreline between Wellington and the Hutt Valley offered a safe road and railway route – parts of the coastal road had previously been impassable at high tide. “While light rail is attractive, bus rapid transit may be a more immediate and pragmatic step and I want significant progress well before 2021,” she said. Here’s my problem: those areas of the map are already red. They are already well serviced by the existing network. Other red-orange areas of the map are the suburbs north of the central city, which have rail links. The link to the Hutt is obviously fragile and only going to get worse. I’d like to see the transport network improve access in poorly-served areas. All that yellow and blue land south and west of the centre city could be opened up, reducing the cost of housing and improving its quality while reducing the fragility of the transport network. Yes, I realise that will cost money and that topography isn’t in our favour. But we are planning to spend hundreds of millions of dollars to improve public transport to people who are already well serviced. Is that the best use of the money? The ‘fury’ at the suggestion of applying fringe benefit taxes (FBT) to carparks is utterly misplaced. The only proof I need of this is that ‘Unionists and business groups have joined forces in a rare alliance to lash out at the new tax’. What better indication that this new tax is being applied even-handedly? It’s about time, too. I have to pay, every day, to park my car in a commercial parking lot. Part of my salary — my compensation for the time I’m in the office — goes to paying for that carpark. People who don’t have to pay for their carparks are getting tax-free benefits, and that’s not cricket. I can only hope that the Government doesn’t lose the courage of its convictions. This effort should be extended to all the little perks and compensations given people in lieu of money. Take those cellphones and laptop computers that employees get for free. Sure, during the week they might need a cellphone to keep in touch with the office or with clients. But after hours? That cellphone is still in use, receiving texts about completely personal dinner parties, making calls about entirely private gossip. And the laptops? They are getting into Facespace and Youtelly not just during office hours but also on the weekends. The technology is there to shut down this rort of the tax system. All that’s needed is an app to disable devices outside of business hours. Then, those electronic toys would be completely tax-compliant. If the international IT cabal won’t do it, the Government needs to step in and take its rightful share. The Government can’t stop there, either. From my office, I can see any number of buildings with stunning views of the Wellington harbour. The sun sparkling on the early-morning ripples, the picturesque hills — those views aren’t available to everyone. Some workers are clearly receiving much more of these benefits from their offices than others. It’s about time the Treasury sorted out some non-market valuation studies of the amenity value of offices and made sure that those perks are properly taxed. In fact, it isn’t just the views and the sunshine. Some workers get more floor space, larger desks, nicer office coffee. What we really need is a ‘defined office package excess’ (DOPE) tax. The Government can set minimum standards for office workers, and any provision of amenities in excess of that minimum gets taxed. Once the process is in place for the Auckland and Wellington CBDs, it can be rolled out to other localities and other types of workplaces. The most egregious evasion of taxes on benefits, though, is going to require collaborative intervention by economists and psychologists to tax properly. It is my understanding that some workers are receiving an additional benefit beyond their wages and salaries, cellphones, nice office surroundings, and the like. A tax system can be properly calibrated only if it contains a PFT — a Personal Fulfilment Tax. I drove to work today. I parked in my new dedicated parking space. My Snapper card did not leave the wallet. Why did I not bus to work? Because I’ve given up on Wellington buses. I have calculated that it takes me an average of 40 minutes to get from home to work (or the reverse). That’s about 15 minutes of walking, 5 minutes of waiting, and 20 minutes on the bus. Times vary a bit for each component and for the overall time. I’ve made it in under 30 minutes, and sometimes it takes nearly an hour. By car, it takes me 15 to 20 minutes. That’s a savings of 20 to 25 minutes each way, or about 45 minutes per day (3.75 hours per week, 172.5 hours per year — less the days I don’t go to the office). As it happens, I can monetise the time savings. I’m on salary and bonus, which means my income is variable and depends on how much and how hard I work. That 45 minutes a day doesn’t just represent time spent with family, as it would if I were on a fixed salary. It represents cold, hard cash money. And it means that taking the bus is actually really expensive. Why am I bothering to tell you all this? I don’t really think you’re interested in my commute — my narcissism is not so grand as that. No, my reason is this: Wellington buses don’t work very well, and it is only by seeing their failure at the individual level that we understand how they fail us systemically. I’ll tell you my individual story and hope that you tell me yours. Then, we’ll all patiently explain to the Council and the bus system that their product is junk. I don’t know why public transport in Wellington is so difficult. If we take the point of view that the bus company has optimised its objective function subject to constraints, then we can only conclude that their incentives do not align with mine. I’m trying to get around town with the lowest cost (time + money). I don’t know what they are trying to do. Sometime I think someone somewhere has just dreamt up a system, and now the job of the bus company is to run that system regardless of its efficiency or efficacy. If that’s the case, the proposed light rail to nowhere makes perfect sense. I would like to ask you to investigate GO Wellington and its owner Infratil for violation of the Fair Trading Act. On 7 August 2012, I arrived at Lambton Quay, North End, Stop F at 4.15 pm. At 4.17 pm, a No. 3 bus did not arrive, although it was advertised. At 4.22 pm, a No. 3 bus did not arrive, although it was advertised. At 4.26 pm, a No. 3 bus did finally arrive, as advertised. This is not an isolated event. Many times, I have observed that a No. 3 bus has not arrived as advertised. Sometimes, I have observed a bus not allowing passengers to board, presumably because the buses were too full. I contend that a bus stop represents an offer to provide services, and a timetable posted on the bus stop represents further details of the services offered. GO Wellington has represented that it would offer a No. 3 bus from Lambton Quay to Karori at the specified times, and then neglected to provide the services when potential customers arrived to purchase the services. I believe these actions constitute failure to provide advertised services and misrepresentation of the services on offer. They are therefore a violation of the Fair Trading Act. I ask that you investigate these actions; that you determine how widespread the violations are; and that you provide remedies for the affected citizens of Wellington. Yes, I am aware that this makes me sound like a crazy old man ranting incoherently on the corner. I’m also really annoyed with the random bus generator that seems to be the basis for the Wellington system. Updated: I’ve corrected the expected value calcs. 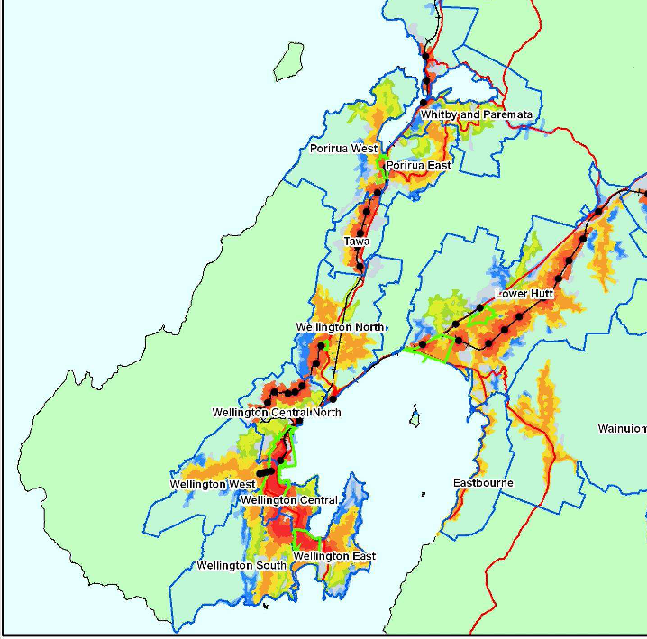 The Christchurch earthquakes have made the whole country more focused on earthquake risk. It has changed the Wellington market for office space, for example, with businesses now putting more weight on earthquake safety. But have we put enough weight on it? One way to look at the problem is with expected value. Expected value is calculated as the probability that something happens multiplied by the size of its impact. From this paper from University of Canterbury, the probability of a large earthquake in Wellington in the next 50 years is about 5% (page 4 — see the disturbing Russian roulette pictures). From the Dominion Post today, experts estimate that a 7.1 magnitude earthquake will kill 1,500 people. The Value of a Statistical Life is about $3.5m. 1,500 x $3.5m x 0.05 = $5,250m. $262.5m. That is, given the known risks of earthquake, we should be willing over the next 50 years to invest over $5 billion $26om on earthquake safety in order to save the lives of people in Wellington. If we think that saving all those lives is impossible (which it likely is), then we can scale the total back. For 1,000 lives saved, the amount is $3.5 billion $175m. This calculation doesn’t say anything about the 13,000 injured however. They need to be added in, too. This is an example of an explicit cost-benefit analysis of the trade-offs we might be willing to make. We can spend some money to make buildings safer and save lives, or we can spend it on other things that also have value (health, education, and margaritas). There’s the trade-off. Yes, it would be nice to have a safe place to work. Workers are even ‘entitled’ to one. But…actually providing one? Well, that could be inconvenient. So, it probably won’t happen. There’s an ad running on TV that reminds us of one of New Zealand’s failings: cold houses. On average, houses are colder than WHO recommendations, and that is making us sick. The government is tackling the problem directly with subsidies for insulation and better heating. I have some ideas, too: build roads and reduce minimum lot size requirements. See, I’m trying to buy a house in Wellington — I have been for about a year. I’ve found out more about land use planning as a result, and noticed how it interacts with transport planning. Basically, it’s making us spend too much on houses. unchangeable — the aspect, view, sun and wind exposure, and proximity to schools and the central city are fairly fixed. In the area where we are looking, the cost of an old, cold, damp house is shocking. What you’re buying are the unchangeable characteristics — location, location, location. Unfortunately, their prices have been bid up so high that there’s little money available to pay for the other things. So, people end up close to the city but unable even to paint their houses, much less add double glazing. I ask why, and the numbers respond. Wellington City went from 158,000 people to 179,000 between 1996 and 2006 (the region’s population is roughly twice that), a 13% increase. Karori is the largest suburb, but the population has increased only 4.2% to 14,000. Wellington prides itself on lots of green space, and mandates minimum lot sizes to maintain a certain population density. But the problem is that the population increase between 1996 and 2006 is one-and-a-half times the population of the city’s largest suburb. Where are all these people supposed to live? By constraining the number of people who are allowed to live within easy access of the city, the council is pushing up land prices. Nice for some, but difficult for new entrants. One solution is transport. We have looked all over the Wellington region, but we keep coming back to travel times. It is difficult to move between suburbs, partly because of topography but partly because no one has bothered to build the roads. It isn’t just commuting, either. It’s also all the running around after children’s activities. But, as I whined about previously, the transport planning doesn’t seem to take this into account. Instead, the plan is that most of the expected population growth of 46,000 will happen downtown. It’s a lovely thought — but the side-effect of trying to pack people into the downtown is that land prices in the inner suburbs will continue to be bid up as people try to buy just a little more garden and one more room. The current house owners won’t have to maintain their properties, but will still receive a healthy capital gain. The next time someone tells you about the healthy green space all around Wellington and the healthy walking lifestyle in the central city, remember the cost: thousands of musty bedrooms where people spend of third of their lives in unhealthy dampness. You are currently browsing entries tagged with Wellington at Groping towards Bethlehem.